I began by expressing the sentiment that appears in the last mishna in Sotah, that when certain rabbis passed away, there was a sense that something sui generis had departed from the world, and that this was the case with R. Amital. He was an amazing combination of simplicity and complexity, confidence and humility, wisdom and common sense, self-assuredness without imposing his views on others. 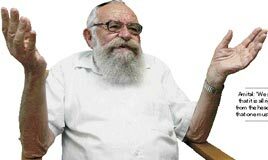 His decision to share the post of Rosh Yeshiva with Rav Lichtenstein was unprecedented and, more than anything else, shaped the distinct path of the yeshiva. I mentioned the line from the first mishna in Avot “ha’amidu talmidim harbeh” – that the idea of “ha’amidu” is to nurture students to the point where they stand on their own, independently. This is best characterized by R. Amital’s relationship with his close pupil and successor, R. Ya’akov Medan. During the Oslo process, which R. Amital famously supported, R. Medan went on a hunger strike to protest the giving of weapons to the PA. R. Amital visited R. Medan in his protest tent and expressed pride in what R. Medan was doing, even though he disagreed with both his positions and his methods. I ended by telling over the “crying baby story,” R. Amital’s calling card, and noting that his vision was for a “beit midrash with windows,” a yeshiva that would sensitize people to the world around them instead of sequestering them from it.